An article in the current issue of Current Archaeology tells of multiple logboat finds in Lough Corrib, County Galway, Ireland. I haven't seen the full writeup (it's pay-to-read), but a decent summary appears here. The five boats, found in various locations around the large lake, were discovered during a bathymetric survey, and they were preserved by the lake's soft mud bottom and (presumably) cold temperatures and still waters at depth. One of the logboats, dated to about 4,500 BCE (Early Bronze Age), exhibits 2-3cm raised features carved on the inner side of the hull. There is a lengthwise feature that serves as a kind of keelson, and four cross-members. The article speculates that these served to divide the hull into compartments, but I think it more likely that they served as strengthening members in the nature of ribs. 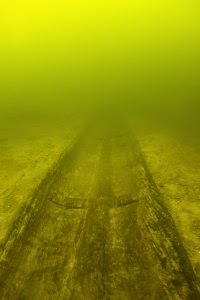 A 3,400-year-old boat was apparently carved in two halves, held together by rods that passed through internal cleats on the interior of both halves, and probably supplemented by lashings through bored holes. (The article summary is ambiguous on this point.) This strongly suggests kinship with the sewn-construction techniques used in England, as displayed in the Bronze Age Ferriby boats and Dover boat. Another Lough Corrib boat, dated to the 11th century CE, was found in conjunction with several battle axes. Although battle axes were introduced to Ireland by Vikings a couple centuries earlier, the article states that it is more likely that the boat carried Irish warriors who had adopted the Viking weapon. Clear evidence for the use of oared propulsion exists in the form of holes for four pairs of tholepins. Five thwart-seats were present, indicating that the boat carried a coxswain or some other non-rowing individual (e.g., a passenger, dignitary or the captain). 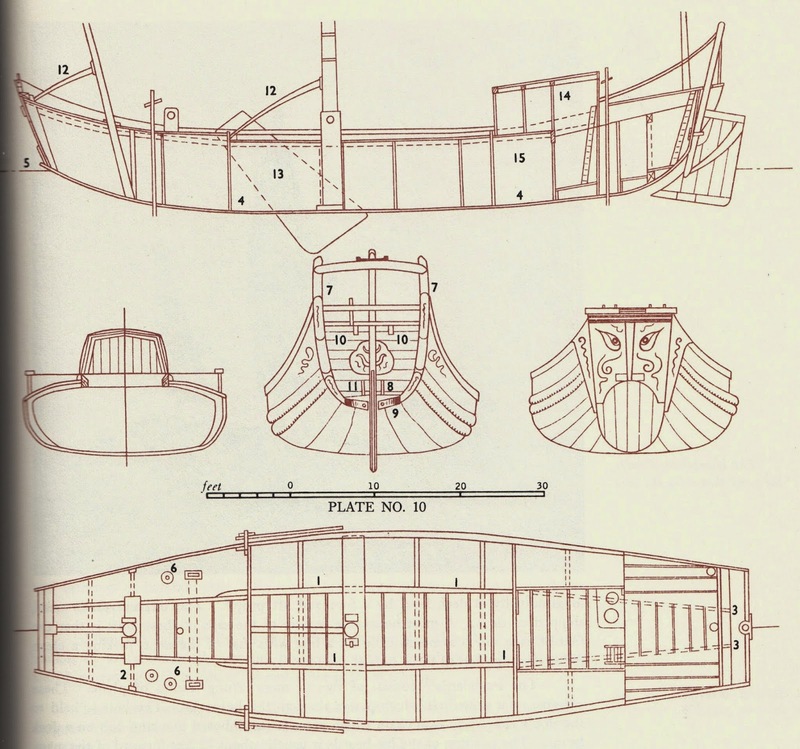 Clinker-planked construction was common by the 11th century, and of course skin-on-frame curraghs were also in use in Ireland at that time, so it is interesting that logboats remained in use for apparently high-prestige purposes that late in Ireland's history. Reader Geoff Cater steered me toward his fine summary page of indigenous Australian watercraft where, along with excellent images of various canoe types, there are a number of rafts. The type that I find most intriguing consists of two triangular platforms, one stacked atop the other and facing in opposite directions. In two of the examples shown, fastening on each layer is by means by wood rods inserted through holes bored through the logs. In the model, the logs are fastened to their neighbors with thread, which may indicate lashed construction on the example from which the model was based, or might have been simply the modelmaker's expedient. Also in the model, the layers are attached to one another with a nail; it's unclear how the layers are attached in the other examples. The photos and captions below are borrowed directly from Mr. Cater's webpage, for which thanks are given. 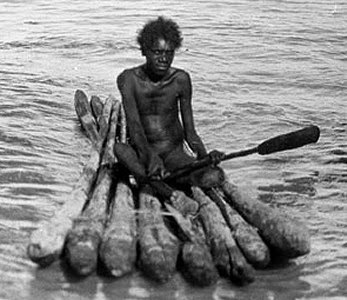 1931: A model raft made from six cylindrical wooden rods, collected in 1931 by Gerhard Laves from Bardi people at Cape Leveque, WA. Description: A model raft made from six cylindrical wooden rods with pointed ends and joined together with thread. 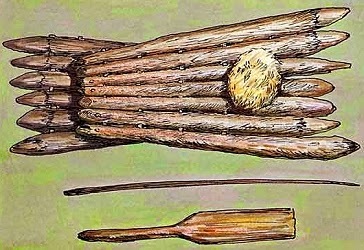 A second "deck" of five pointed cylindrical wooden rods are attached to the first with a metal nail. Source: National Museum of Australia. 1931-1994: Double triangular raft, pole and paddle, Western Australia. Illustration by Xiangyi Mo. Barlow: Aboriginal Technology: Watercraft (1994) page 27. The illustration by Xiangyi Mo is possibly based on the model raft held by the NMA, above. The grass matting is possibly represents a seat or, if mixed with mud, a hearth for the fire often carried on board. Below are a punting-pole and a short-staffed spoon or pudding-stirrer paddle, as used by George Water in the photograph [below]. Their use throughout the continent and Tasmania indicates the pudding-stirrer's great antiquity, perhaps back to the last of the migrations from SE Asia. 1916: Worora youth on a mangrove tree raft (or 'kaloa'), George Water, Western Australia, 1916. Photograph by Herbert Basedow (1 of 2). Basedow, Herbert: The Australian Aboriginal. F.W. Preece & Sons, Adelaide, 1925, plate 22. In the model and, apparently, in the 1916 photo, the ends of the two layers line up pretty well. In the drawing, the two layers are offset, so that the logs' wider ends extend beyond the other level. Why did the raftmakers face the two triangles in opposite directions? If two layers of logs were needed for buoyancy, it might make more sense to place the narrow ends one atop the other to form a roughly conventional "bow," since a forward-pointing triangle is more hydrodynamic. But as the photo shows, the bottom layer seems to provide enough buoyancy to hold the top layer and its passenger nearly or entirely clear of the water. By reversing the directions of the triangles, the logs of the top one do not nestle between the logs of the bottom one, so the top one actually rides higher and drier, while the forward-pointing triangle on the bottom still provides the desirable hydrodynamic efficiency. Both the drawing and the photo show short, one-handed "pudding stirrer" paddles, and the drawing shows a pole as well: no doubt poles were commonly used for propulsion in shallow water. A sha-ch'uan or sand boat. The big basket tied to the house side is not a dinghy: it's a sea anchor. Illustration by Valentin A. Sokoloff. Click any image to enlarge. 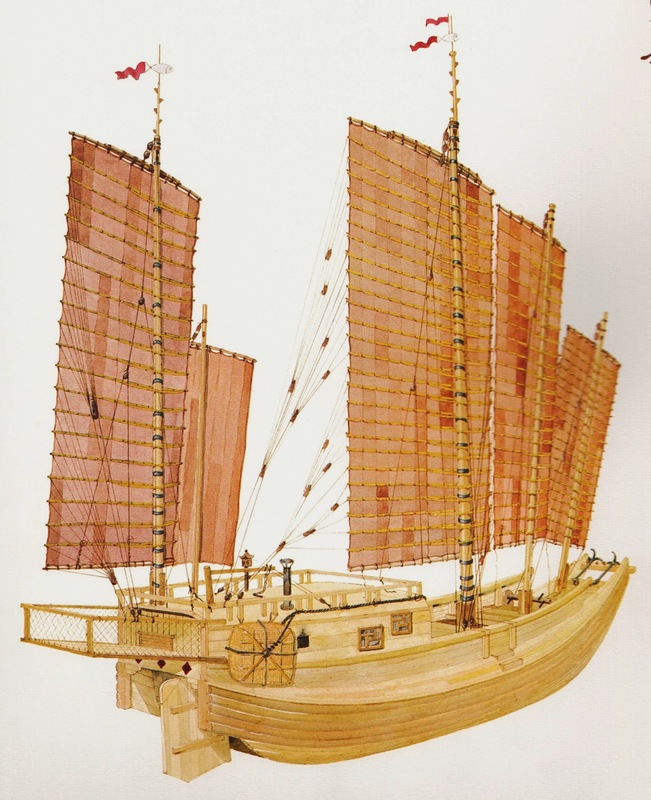 Some aspects of the design and construction of Chinese junks are pretty familiar: one the best known is the use of numerous bulkheads rather than frames to provide transverse strength and divide the vessel into a series of watertight compartments. Others are the lifting or retractable rudder, and of course the fully-battened lugsails that are almost synonymous with the term "junk." One design and construction element that is not so well known, though, is the whaleback shape of the hull on many junks. One type exhibiting the whaleback was the sha-ch'uan, or sand boat, which was in use well into the 20th century. These bluff-bowed Kiangsu traders typically measured 85' LOA and 18.5' beam, and were distinct from larger traders of the same port by generally finer lines. 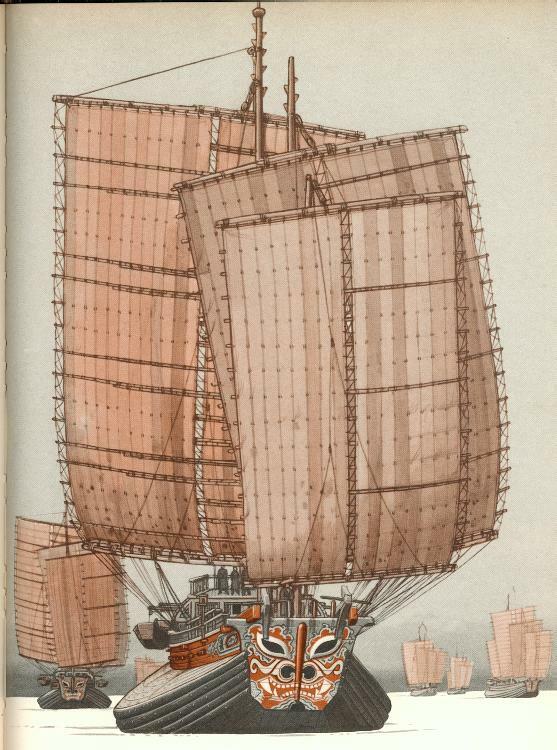 Among the more obvious features of the sha-ch'uan is the five-masted rig, in which only two of the masts were stepped along the vessel's centerline, and all of which were raked at different angles, so that they were splayed like the fingers of an open hand. The two drawings above show different sail types: only the mainmast carries the familiar fully-battened Chinese lugsail in Worcester's line drawing, while Sokoloff's watercolor shows that type of sail on four of the five masts. Cross-section of sha-ch'uan. Note the use of frames along with the bulkheads to provide transverse strength. Illustration by Sokoloff. Cross-section of sha-ch'uan. Illustration by Worcester. Sokoloff surely based his color cross-section on Worcester's. Both show the whaleback structure, in which the hull-proper angles sharply inboard from a chine that is well above the waterline and might almost be called a sheerline. Worcester calls this top surface a "guard deck," but from a construction standpoint, it's really the upper surface of an all-around hull, like that of a submarine's (although it is pierced by numerous hatches). The main deck is added atop the guard deck, and there are planks, apparently enclosing dead space, that fill the gap between the guard deck and the overhanging ends of the main deck. With its extreme tumblehome, the whaleback junk seems to give up a lot of storage capacity compared to Western ship design, in exchange for superior safety. Should the junk's entire upper deck and house be swept away, its hull would remain intact and enclosed. There were numerous incidents of Western-style wooden ships losing their houses in storms and sinking as a result. 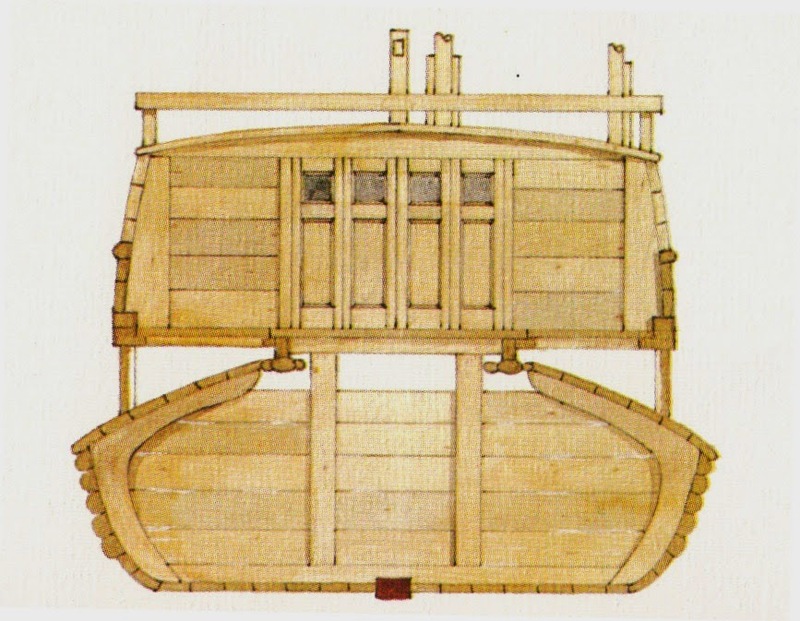 Although the sha-ch'uan had no backbone, it did have a substantially thicker central plank that provided some longitudinal strength (and some lateral plane), aided by several half-round wales along the sides and three timbers running full-length along the top surface of the guard deck at both sides of the hatches. Rising well above the waterline was a false stern that extended 7 feet aft of the hull proper, and beyond that was a 10-foot-long stern gallery. The sha-ch'uan was by no means the only whaleback junk. Two more are shown below, and Worcester's book contains many other examples. 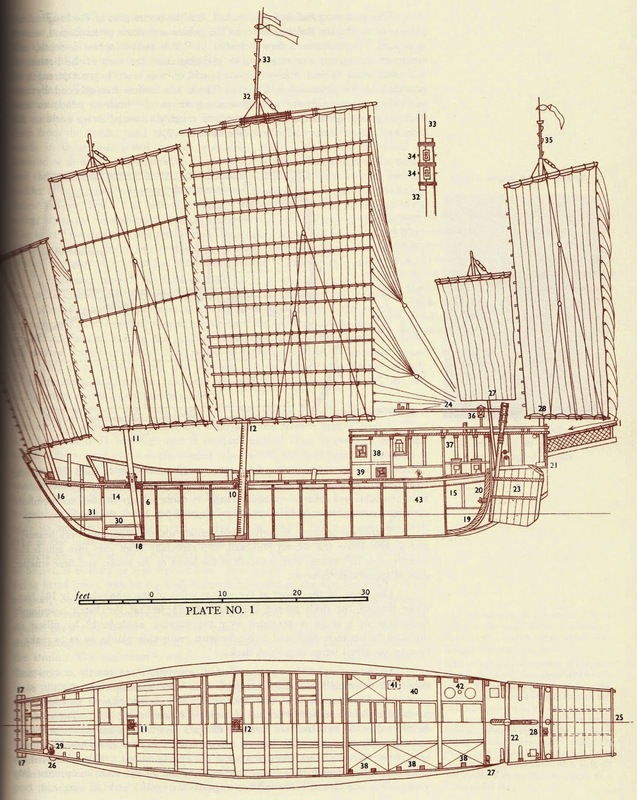 Although its built-up gunwales make it less obvious than on the sha-ch'uan, the shaohing-ch'uan, or Hangchow Bay Trader, also had whaleback construction. Illustration from Worcester. In contrast to the preceding image, the whaleback construction of this vessel is entirely obvious, its deck being far narrower than that of either the sha-ch'uan or the shaohing-ch'uan. Very heavy wales just below the sheer-chine add great strength to the structure. I have no information on the vessel type, identified by artist/author Bjorn Llangstrom only as being a warship similar to that upon which Marco Polo returned home to Europe.